NOTE: Only images uploaded of ART created by a child, grandchild, student, or yourself will be accepted and processed. Anything other than hand-created ART will not be processed by Budding Artists. Please be sure you have reviewed the Art Guidelines below. Attention: For best quality reproduction, keep in mind the following tips. Failure to do so may result in some cropping of the image. A printable version of these guidelines can be downloaded here. Focus your design in the center of the paper and then add colour extending to the edges. Artwork should fill the paper, but keep critical elements (such as names/ graphics) within ¼ inch (7 mm) of paper edge. DO NOT create a border to define this space. Ensure that each art piece is well concentrated in colour. The more colour used, the better. Artwork created with the following works best: crayons, watercolours, tempera paints, markers, paper collage and/or pastels. DO NOT use glitter or metallic and fluorescent markers. These mediums do not reproduce well. Each piece could be signed by the artist. The signature must be located a minimum of ¼ inch (7 mm) in from the edges. Erase all unwanted marks, lines and smudges. DO NOT submit artwork with any guidelines showing. Make sure the image is square. The easiest way to do this is measure 2.5 inches down from the top of a standard letter size paper (8.5″ x 11″) and draw a thick line across the page. 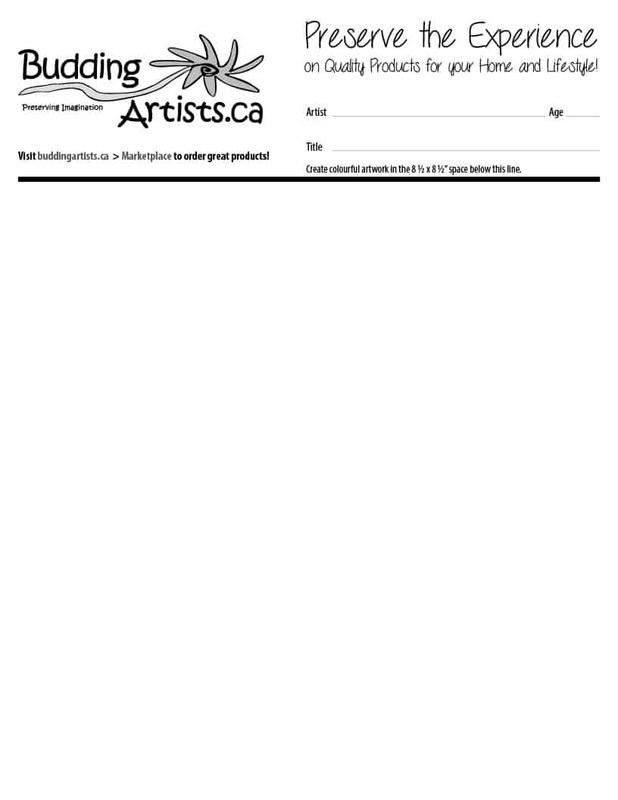 Or download and print this blank Budding Artists canvas. 8 ½” x 8 ½” is recommended as it’s the most available – use standard letter-sized printer paper with line marked as above. The image MUST be square as all the products we offer accept square images only. The image must be scanned or photographed as a 300 dpi jpeg and uploaded with your product (see product details page for Image Upload). If you don’t have a scanner, use your phone or good camera and take a picture! It may capture the colours better than a scanner anyway. Be sure you don’t have any shadows across the image. Try to avoid using the flash – natural light is best. Make sure the image is in focus. Each piece must be ready for print. It is the customer’s responsibility to make sure that all artwork meets the above guidelines. Budding Artists will not reproduce artwork it deems inappropriate. Budding Artists reserves the right to use artwork for promotional purposes. Make it fun – encourage the child and praise them for their effort, no matter the end result!